It’s been 33 years since she moved from Hong Kong to Toronto, and four months since I did the opposite. This is how I became my mother’s tour guide in her own hometown. The crowded streets that are familiar to me are now unrecognizable to her. I guide her through the modern subway system, which was constructed after her departure, and advise her on the best bus routes to take to meet up with her old school friends. We walk together through Central, the city’s financial district, among 70-story skyscrapers and modern steel structures that my mother has never seen before. I introduce her to some of the great local restaurants I’ve discovered; she uses her Cantonese fluency to order dishes that aren’t on the English menu. Together, we are the ultimate Hongkonger. It’s been 33 years since my mother moved from Hong Kong to Toronto, and four months since I did the opposite. While we devour her expertly ordered meal, my mom comments on how much my Cantonese has improved. This food I’m enjoying and the language I’m eagerly practicing is a stark contrast to the attitudes of my youth. I credit my childhood apathy toward my mother’s culture to the whitewashed Toronto suburb where I grew up, one of three Chinese kids in an elementary school of 300. I wanted nothing more than to be just like my white Canadian peers with their Wonder Bread sandwiches and after-school ballet classes. Instead, I was forced into weekly piano lessons, which I loathed, and fed traditional Chinese meals of steamed meat and stir-fried vegetables over heaping bowls of rice, which I thought were bland. My mother put me in Chinese school on the weekends to learn her native tongue, but replacing my Saturday morning cartoons with rote repetition of stroke order and Chinese characters instilled in me a repulsion for the language. Whenever she spoke to me in Cantonese, I’d understand perfectly, but reply back in English. 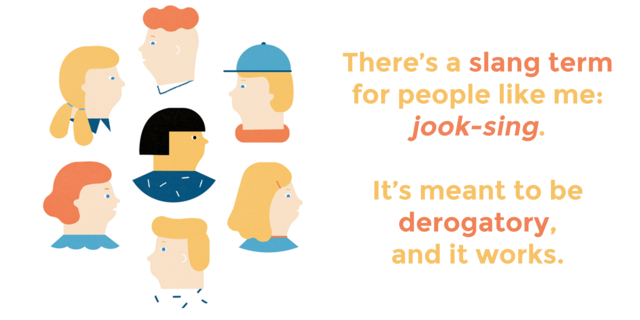 There’s a Cantonese slang phrase to describe people like me: jook-sing. Literally, the term refers to a knot in a reed of bamboo that prevents water from flowing from one end to the other. “You look at bamboo. It looks like it should be all hollow, but actually there are parts where it’s closed inside,” my mom explains. “That’s like you. You look like you’re Chinese but you’re not really Chinese because you do not understand the language and the culture.” It’s meant to be derogatory, and it works. My mother and relatives would tease me, my sister, and my cousins for being jook-sing when we spoke our accented Cantonese or used our chopsticks incorrectly. Witnessing her children stuck between two cultures must have been frustrating for my mother, too. Although she had moved to Canada to live and raise kids in a Western environment, with Western values and beliefs, she didn’t know what the norms were. She had only her own childhood experience to draw from. Growing up in poverty, she had adopted an eat-or-be-eaten attitude as the second eldest of six siblings. 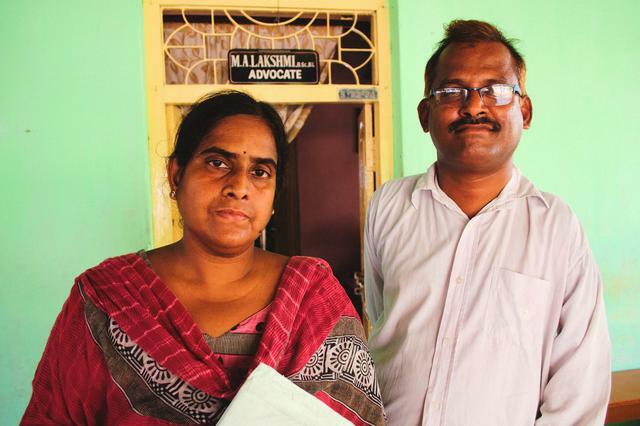 She witnessed how her father’s strong work ethic brought him from low-level garment seamster to factory foreman and later to top-level manager. She was taught by strict Catholic nuns at an all girls’ high school, which undoubtedly influenced her own parenting style. The chaotic city life and incredible academic, societal, and economic pressures of Hong Kong were what eventually pushed my mom out of the city. Between the time my mom left in 1976 and the handover of Hong Kong from the British to the Chinese in 1997, a slew of Hongkongers fled to the west. I went to high school in a city that was popular with recent Hong Kong immigrants and their children, who became my classmates. I befriended many but I could never really relate to them, instead seeking distance from them and my mother’s heritage. When I registered for university and renewed my passport, I omitted my Chinese middle name on the application forms, thinking it might make me seem less Chinese and more Canadian. It wasn’t until I was removed from this environment that I recognized the gap in my identity. In my third year of university, I studied abroad in Copenhagen and traveled through Europe. I visited parts of the world where the concepts of immigration and visible minorities were virtually unheard of. At a bar in the Old City of Dubrovnik, I met a group of young Croatian girls who were celebrating a friend’s 18th birthday. They fawned over my foreign appearance, a rarity in eastern Europe. “China! You’re from China?” one of the girls asked in a tone that wasn’t racist, but inquisitively earnest. Growing up with my mother, and among other Chinese immigrants, I never once imagined that I might one day live in Hong Kong. But then I graduated from university on the brink of a recession with no job prospects at home. Hong Kong was a natural destination. I easily found work with an English teaching agency, and was trained with 60 other expatriates, who were mostly white and from the United Kingdom. Skills that I had snubbed in my adolescence now gave me an edge over the typical new arrival to the city. Over heavily accented Cantonese, I negotiated with my landlord for cheaper rent. I enjoyed blending in with the crowd, slipping into clothing stores and shopping for groceries unnoticed, until my accented Cantonese outed me as a foreigner. While my new colleagues fumbled with their chopsticks at group lunches, skeptically eyeing the steaming bamboo baskets of curried cuttlefish, shrimp dumplings, and pillowy white buns with mystery fillings, I found comfort in these dishes that were more familiar to me than the strangers I was seated with. Eventually, these strangers did become my friends. But over time, as my social networks expanded past the English teachers I first arrived with, I met more and more expatriates like myself — the children of Hong Kong immigrants who were born, raised, and educated in the West, but had settled in Hong Kong for work. Although these were the very people I was eager to distance myself from in my youth, in our parents’ homeland I discovered a camaraderie that was missing before. No one has tracked the number of Western-born people of Chinese descent living in Hong Kong, but data from a 2013 analysis by Pacific Prime Hong Kong suggests that there are roughly 301,000 expatriates living in Hong Kong — a big jump from the 252,000 expatriates living there in 2009. 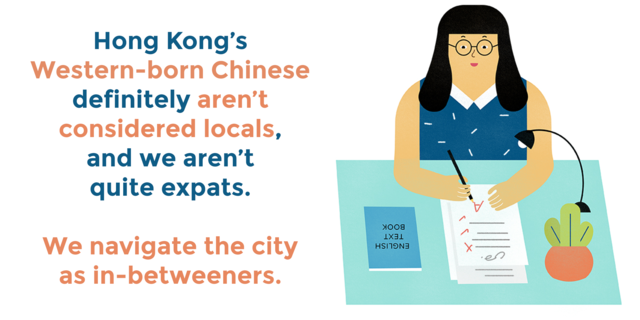 Hong Kong’s Western-born Chinese definitely aren’t considered locals, but we aren’t quite expats either. We navigate the city as in-betweeners, with our varying knowledge of the local customs and norms, the language and food. Yet we retain our Western values, among them a sense of individuality and freedom that would be considered a rebellious trait in a traditional family-centric Hongkonger. Working as an English teacher, I found that my in-between status hindered rather than helped. The schools where I taught English requested an immersive experience for their students, meaning that they wanted native English speakers who didn’t know the local language. The supervisor of my second teaching job, Pamela Bovitz, instructed me to pretend that I didn’t understand a word of Cantonese. “She knows what we’re saying!” the kids would insist in their native tongue, aware that I was one of them. I feigned confusion and fought the urge to reply back in Cantonese. At the kindergarten where I worked, I was hired to teach these young students English. But through the playground games and classroom conversations I overheard, the students inadvertently helped me improve my second language, too. Every morning, I listened to them sing their school’s anthem in Cantonese, and one day I sang it for my mother. In between fits of laughter, she helped me translate the song and understand the lyrics. After completing my teaching contract at the kindergarten, I was eager for a change but was not yet ready to leave Hong Kong. After enrolling in the University of Hong Kong’s Master of Journalism program in 2010, I met Stephanie Chan, a Toronto native–turned–Hong Kong resident. “A lot of my friends in teachers’ college were scrambling to find jobs” after graduation, Chan recalls. “Many couldn’t get permanent teaching jobs in the districts that they wanted.” Chan looked abroad during her search for work, and in 2007, accepted a position teaching middle school at the Canadian International School of Hong Kong. Though Iris Lam was born in Hong Kong, she immigrated to Canada with her family in the late 1980s when she was just a small child. She had the opportunity to return as an adult, when her employer, a luxury hotel company, promoted her through a transfer to the company’s headquarters in Hong Kong in 2011. Lam worked there for two years and was then was transferred to Shanghai. She returned to Hong Kong in 2014 to work for the Mandarin Oriental Hotel Group. Second-generation reverse migration isn’t unique to Hong Kong. Second-generation reverse migration isn’t exclusive to Hong Kong. I met Sandy Oh through a mutual friend in Hong Kong as she was stopping over on her way to Seoul. Oh’s mother and aunt left South Korea for New York City in the mid-1970s, where they both found better-paying nursing jobs. Oh moved to Seoul in 2008, and like me, she easily found work teaching English. Later, she became a textbook writer and developed teaching curricula for a private academy. Inspired by her experience working with upper-class teens, Oh earned a PhD studying the issues of global education and Korea’s international high school students. She has since returned to Seoul three times and is currently conducting long-term fieldwork in the city. In 2009, my mom retired from a fruitful 35-year nursing career in Canada. 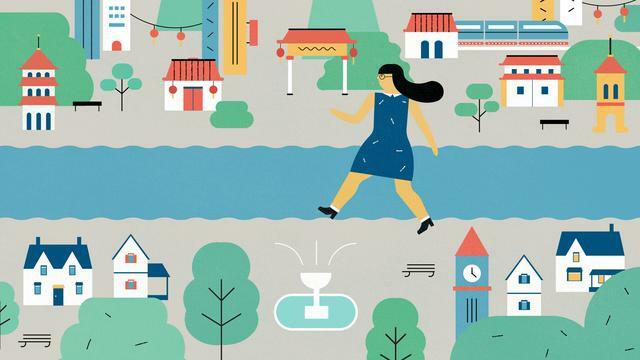 With time on her hands and a desire to see how her hometown had changed (and to see me, of course), she celebrated her retirement with an extended seven-week holiday in Hong Kong. Her last visit to the city had been in 1982. Over the years, my mother has never been very sentimental about her upbringing. She’s told me bits and pieces, but being in her hometown and seeing certain things for the first time in nearly three decades triggered a flood of memories from her past: a department store where her father used to take the family shopping on the weekends, a spicy Shanghainese noodle dish that she’d always eat after school with her classmates, or the sound of the rickety old trams with their characteristic ding ding. One afternoon during my mother’s stay, I took her to the Hong Kong Museum of History. Part of the museum’s permanent exhibition includes a reconstruction of a room in a postwar tenement building, meant to recreate the rough conditions that Hong Kong’s increasingly poor population lived in at the time. My mom’s eyes lit up when we turned the corner and the exhibit came into view. “This looks just like our first apartment! I used to sleep on the top bunk with your dai kau fu and yi yi,” my mom said, pointing to a small bunk bed tucked into the corner. “We had to sleep this way,” she gestured, holding her arm widthwise across along the bed, slicing her hand three times to represent the three children who slept there. I imagined my mother there, sleeping in a bed with her siblings like sardines, in a room so iconic in its squalor that it’s now preserved in a history museum. “The bottom bunk was where your po po and kau fu would sleep,” she continued. “And your gong gong would sleep on a cot.” The bathroom and kitchen were shared with another family of six. My mother’s family lived there for five years before her father, my gong gong, earned enough to support the growing family’s move to better accommodations and their eventual emigration and establishment in Canada. On her first trip back, my mom kept busy touring the city with me and catching up with old high school friends whom she hadn’t seen in decades. Her retired life now allows her the freedom to fly back to Hong Kong for a few months each year. She’s living comfortably, thanks to a sizeable pension plan that she wouldn’t have attained had she worked in Hong Kong, along with savings from her shrewd frugality — a trait that’s stereotypical of Chinese immigrants, but which I’m now grateful for having adopted. My mom knows they’re teasing, just like how she used to call me jook-sing when I fumbled with my Cantonese as a kid. But I know my mom has some jook-sing in her, too. Those knots developed in her as she found her way in Toronto, adopting Canadian habits and merging them with her Chinese upbringing. I’m back in Toronto now after four years in Hong Kong. Although I thought of what life would be like if I were to stay in Hong Kong permanently, my heart always was — and still is — in Toronto. Life was easier abroad, socially and career-wise. Ironically, I’ve struggled to make friends and find my footing in my hometown, but I’m establishing a fruitful freelance writing career and a good group of friends, old and new. Spending time with my extended family in Toronto is a definite benefit of being back home. I feel proud to cook Chinese dishes for my Canadian friends and converse in my improved Cantonese with the aunts and uncles who used to mock me. Although I’m grateful for the linguistic and culinary skills I’ve picked up, what I value most from my time away is the appreciation I discovered for my in-between identity. I used to be ashamed of the place that I occupied between two cultures, but now I’m grateful for these knots because I know that they’re what tie me together. Andrea Yu is a freelance culture writer and copywriter based in Toronto, Canada. More of her writing can be found at andreayu.ca. Janny Ji is a recent graduate of Rhode Island School of Design. Now she works as a New York–based illustrator and graphic designer.